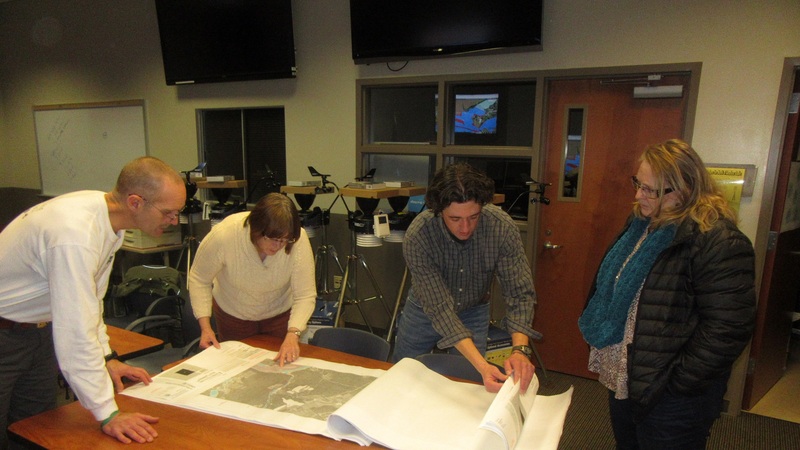 Looking over new FEMA flood plain maps with Wyoming County GIS coordinator Chas Mead (second from right) are (from left) Tunkhannock Township supervisor Randy White, Tunkhannock Township secretary Judy Gingher, and Washington Township secretary Lora Seidel. Though FEMA is fully responsible for new flood plain maps issued for communities along the North Branch Susquehanna River, municipal officials in Wyoming County are tasked with making them available to area residents and fielding questions about potential appeals. Dziak and county mapping and GIS coordinator Chas Mead conducted a meeting at the Emergency Operations Center in Tunkhannock on Jan. 8 that was attended by about a dozen township leaders. Officials from all municipalities in the flood plain are encouraged to conduct public meetings to allow residents in low-lying areas to see the maps and to direct them to the resources they need to seek amendments or exemptions. “FEMA sent a lot of stuff, but some of you may not have seen it,” Mead noted, offering to provide a link to his copies of the maps and documents to anyone who needs it. Mead also offered to attend as many of the public meetings as he is able. Some townships have already conducted those meetings or are planning to do so soon. A few are collaborating to hold meetings jointly. Some people are confused by the fact that the maps issued in 2012 have been updated again without any major river flooding since 2011. Those maps, Dziak explained, were produced from engineering studies conducted in July 2011, before the fall flooding, and therefore were already obsolete when they were released. Those in attendance questioned changes that seem to put some properties in the flood plain that have no known history of flooding. Others wondered what impact the new maps would have on the owners of properties without structures on them. To the latter, Dziak said that he does not believe that they would require flood insurance, but there would likely be restrictions to any future construction there. Exeter Township supervisor Rich Wilbur felt that FEMA’s basing flood predictions for the entire county on levels recorded at Meshoppen was unfair, noting that river levels in Falls are more in line with those in Wilkes-Barre. In addition to a public announcement for the meetings, Mead added, residents who are directly affected by the changes should receive a letter in the mail. Contesting the new maps won’t be easy or cheap, officials cautioned. To file an appeal with FEMA for a letter of Amendment requires a new hydrological study conducted by an engineer at the property owner’s expense. The property owner is out thousands of dollars, whether or not the appeal is successful. Once the maps are finalized, municipalities have six months to update their ordinances based on the updates.